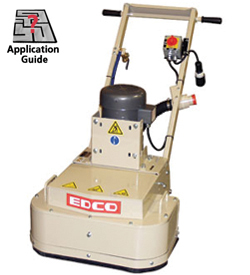 Four Disc Grinder Rental – EDCO 4EC-5B-52800, manufactured by EDCO, is available for rent in Rochester NY, Ithaca NY and the entire Western New York region from the Duke Company. Electric powered, 5 horsepower, four disc floor grinder with 36 inch working width and 13 horsepower engine. Capable of grinding approximately 800-1,000 square feet per hour at 1 / 32 of an inch. The machines technology includes counter rotating discs wich help prevent he the grinder from moving side-to-side – resulting in greater operator control.